OK first of all, I wish I had taken pictures, but my poor camera was sans batteries. 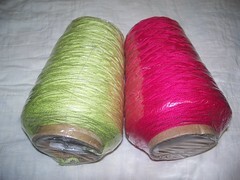 Gove yarns defies description. People, I would live there if I could. What I didn’t know going into it was that Gove yarns is an antiques AND yarn shop. Walking in was a pretty amazing experience. Especially since calling Gove a city is actually pretty flattering (no offense Gove) the yarn shop is the nicest place in town. Gove yarns has an amazingly charming combination of old and new, with antique trunks and furniture just overflowing with yarn. It is the type of shop where visually you are overwhelmed and find yourself digging through trunks of yarn, just to see what else might be there. She had flatfoot yarn, which I passed by through some unknown self preservation method, and in another room had a good variety of TLC and other acrylics, the selection here was vast! In the end I got the issue of Interweave Crochet with the Babette blanket in it, and the Fall of ’06 Interweave Knits, the place was a treasure trove of back issues! 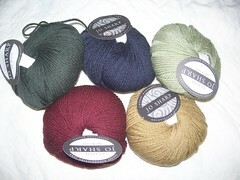 Also I was lucky enough to score some sale yarn! 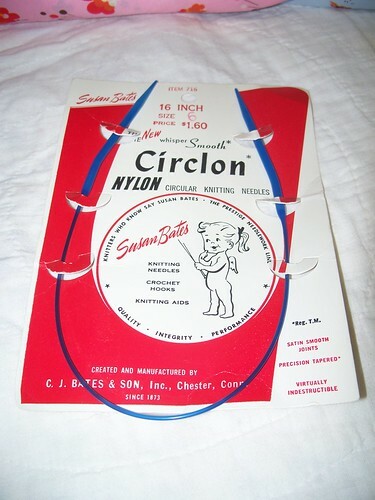 I fell hard for these vintage needles, she had a whole basket of them, and I consider it a total personal victory that I didn’t buy the whole lot…. but these were too sweet to pass up! I highly doubt anyone just “ends up” in Gove, but if you happen to be nearby, I recommend the slight jaunt off the highway, it will be well worth your time. What a great haul! I love those vintage needles. I don’t think I’d ever take them out of that funky packaging.